The Dutch forward is set to leave Dingwall after just seven months. Ross County's Kevin Luckassen is set to complete his move to Slovan Liberec after undergoing a medical with the Czech Republic side. A fee for the Dutch forward was agreed between the two clubs with the 20-year-old poised to undergo tests on Thursday ahead of the transfer. 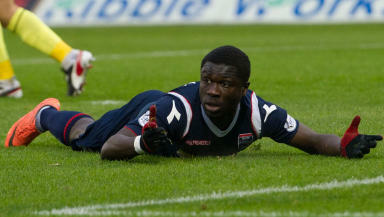 Luckassen joined the Staggies on a two-year deal in the summer but has failed to score in 16 appearances in Scotland. County boss Derek Adams signed Yoann Arquin and Jordan Slew during the January transfer window. And he told STV the deal is a good one for his club. He said: "We have agreed a fee with Slovan and Kevin is away across there for a medical today [Thursday]. "The transfer window closes tomorrow so we will see what happens in the next 24 hours. "It is a significant amount of money that we’ve agreed and it is a good bit of business. "We signed Kevin in the summer on a two-year contract and he is one we had high hopes for but the money that has come along is good money and something we couldn’t turn down."